About: The Spurstowe Arms has a relaxed and homely atmosphere, serving pub food and real ales. "the Spurstowe seems to have bit of everything you want - a fine pub indeed"
It’s not hard to find good pubs in Hackney these days, in fact sometimes it feels like there’s an overpriced gastro institution on every corner. So no surprises that the Spurstowe Arms is the archetypal gastro pub and its set on a quiet corner between Hackney and Dalston – so proving the rule (kind of). Inside, the traditional pub dispenses with the need for worn in chesterfields (yawn) and makes do with a perimeter of tables and chairs that can fit big groups and small together in unison – which is what you want in a pub led by its food. A large bar arcs into a horseshoe and acts as the heartbeat of the place, pushing pints across the counter into the ether like it was pumping blood into arteries. The clientele is a mixture of the local well-at-heel creative crowd and a few destination drinkers who might have searched the place out in the curiosity of visiting ‘one of those Hackney gastros’. Generally there’s a good-natured vibe, sometimes sullied by the surly staff – which is just something you have to put up with in this part of town when everyone’s something else other than the job they’re doing – and entertainment comes from occasional DJs or otherwise whatever’s on the stereo. There’s no denying that the food is good. Classics like steak, fish and chips, roast dinners and pan-fried sea bass are all cooked excellently and although prices tend to be high you seem to get what you pay for. Get Bloody Mary’s on Sundays, hot toddy’s in the winter and at all other times make do with the good range of lager and ale kept behind the bar. 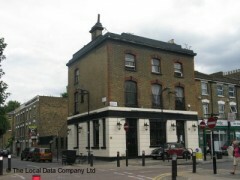 With a sweet little garden out back as well, the Spurstowe seems to have bit of everything you want - a fine pub indeed. I know that everybody says this about any pub that serves a roast and doesn't smell like a toilet but you could easily while away a good day in here. Actually, scratch that, you could stay for a whole weekend. The food is good (okay, a little expensive), the atmosphere is always fun and it has bags of character and personality. I just can't believe I've been coming here for four years and only recently got out into the garden - a sweet little yard.